This year we are super pleased to be working with Center Parcs as part of their family blogger club. As part of this experience we were invited to enjoy some pampering at one of their aqua sana spa's. We were not obliged to blog about it, however we had such a fabulous experience that I wanted to tell you all about it. We had never visited Center Parcs prior to this visit. The communication between the spa and ourselves before our visit was fantastic and when we arrived at Center Parc's Whinfell, the security team were expecting us and directed us where to park our car and handed over a map with directions of how to get to the spa. We enjoyed a 15 minute stroll through the woods towards the spa. I think it would be impossible to get lost here, every 4th lamp post displays directions which is a fantastic touch (follow the squirrel for the spa). Our check in at the spa was smooth. We were given a personal locker key which contained our own robe and towels. As part of our spa experience we enjoyed pastries and coffee in the vitality cafe-bar which was a lovely start to our day. The quality of the food and coffee was very good. 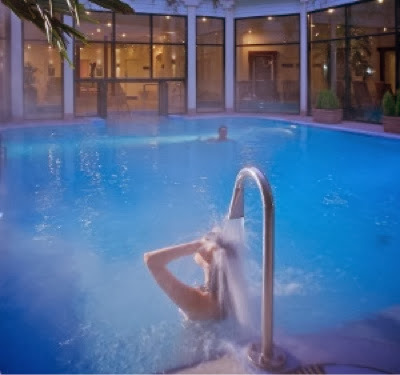 World of spa is the best spa I have experienced in the UK. There are so many ways to relax. 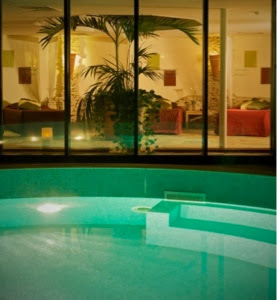 The whole spa area is huge with heated floor tiles and cosy corners throughout. There is a special designated quiet area as well which is a nice place for those who want total calm. Soothing music is piped around the spa and there are refreshment tables dotted around with water and juices that you can help yourself to. There are lots and lots of loungers, reclining chairs, tables and foot stools which was very refreshing to see. In all of my previous spa experiences there are never enough. That is certainly not the case here. There were always attendants available to refresh your towels and replenish drinks. There are two small pools for you to enjoy - the first one is indoors and is part pool/part jacuzzi. I think idea is to swim around the pool which has various jets/bubbles which focus on different areas. The outdoor pool is heated but is just warm - not hot. It was strangely very pleasent floating around outdoors in the rain for a while. One of my favourite experiences was the Greek Herbal bath. Everybody has their own individual seat in a room that is strongly influenced by Greek design. The focal point of the room is a herb table featuring chamomile, sage and rosemary. Every 12 minutes steam released over the herbs which fills the room with a lovely relaxing scent. Another favourite room of mine was the Japanese Salt Steam room. This room was very hot and steamy - so much so that it was hard to see in front of you when you first entered the room. 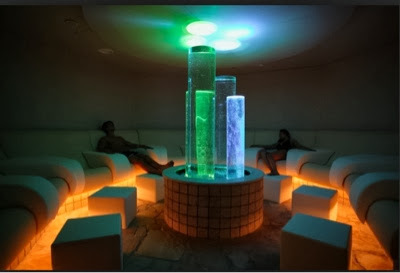 This room is circular and the main feature is a rose quartz in the centre of the room which is said to relax. 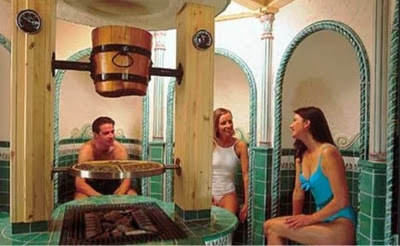 The chairs are designed to that you lie back and inhale the salt and steam. Very good for clearing the airways! Other rooms to enjoy include a large traditional sauna, a Turkish hamman, Indian blossom steam room, Laconium and a Balinese steam room. These rooms were never crowded and you were free to come and go as many times as you pleased throughout the day. Other parts of the spa to enjoy are the Japanese spa garden and Tyrolean garden. It was a bit too cold to brave the gardens in January but they were nice to admire from inside. 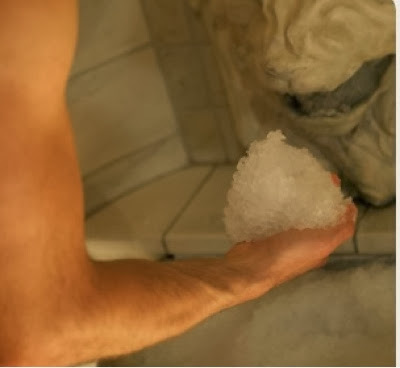 There is also an overflowing ice fountain which you are encouraged to use straight after the sauna! Talk about a shock to your system! Invigorating though! We also enjoyed using the reflexology foot baths - there are 4 near the entrance. You pop your feet in, press the start button and wait whilst the bath fills with water, bubbles and then drains away. Lovely! In the quiet zone there are 4 water beds which looked amazing! They are covered in luxurious bedding and surrounded with drapes and candles. They looked wonderful however we didn't get a chance to have a go as people did tend to stay on these for hours so we never got a chance. Never mind - there is always next time! 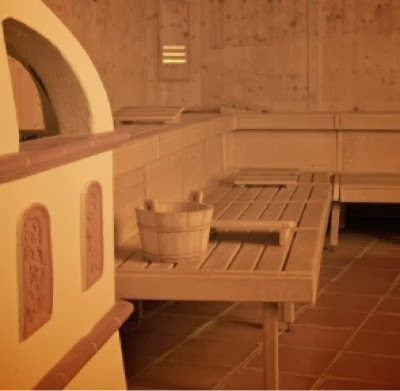 There are 3 group spa sessions in the sauna and 3 complimentary beauty classes throughout the day. I have heard hear are fun, however we didn't participate on this occasion. Lunch was included in our spa day and is a very chilled out affair. It is taken in the vitality cafe and you are encouraged to enjoy wearing your robe. My husband enjoyed a fresh salmon salad and I enjoyed a Spanish style panini with chorizo and roasted peppers. Both lunches were served with freshly squeezed orange juice and were of a very high standard. Service was also very good. There are a range of hot and cold drinks, champagne and even cocktails on offer so a great place to take a breather if relaxing is all getting too much. My husband was booked in for a men's stress reliever massage and facial. His treatment lasted for an hour and it was very relaxing. I opted for an Indian head massage as I've never enjoyed one before. You are asked to wait in the treatment lounge before your treatment where you can help yourself to herbal teas and juices. You are also asked to complete a short health questionnaire. My therapist called me through to her treatment room and the treatment was thoroughly explained. She left the room while I made myself comfortable. The treatment was lovely and relaxing and used the most gorgeous smelling oil on my hair. It ended with my therapist giving me personalised ideas for perfect products to buy for my skin/hair type (no pressure though). You are then taken through to the post treatment relaxation lounge where again you can help yourself to complimentary herbal teas whilst relaxing on the beds and sofas. My therapist brought me some hot water and lemon which was lovely. 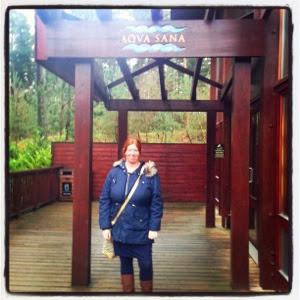 As you can see, we had such a wonderful day at The Aqua Sana spa at Center parcs. I think because of it's size,I perhaps wouldn't recommend it to large groups (as you would probably never see each other as there's so much to do). It is absolutely perfect for mothers and daughters/sisters/couples/groups of 2 or 3 friends to enjoy. Next time a spa day is needed, I will not hesitate to re-book here. Nb I have taken some photographs from the center parcs/aqua sana website as cameras/phones are not allowed in the spa area.